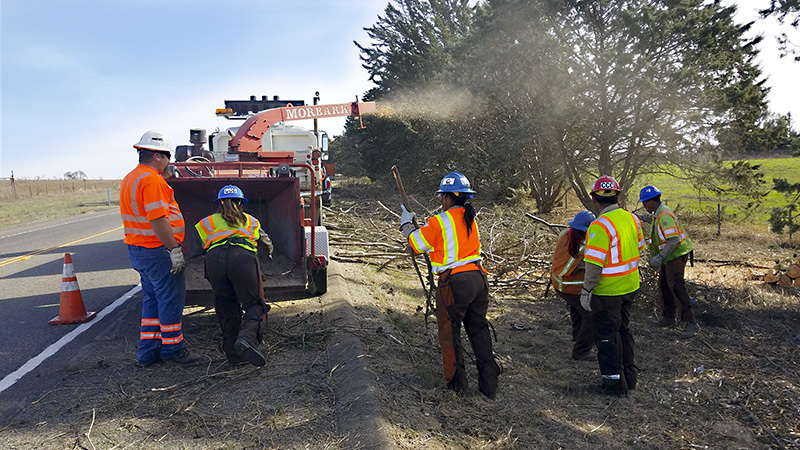 CCC crews perform landscape work along a highway, one of the several types of projects eligible for ATP funding. The Active Transportation Program (ATP) was created by Senate Bill 99 (Chapter 359, Statutes of 2013) and Assembly Bill 101 (Chapter 354, Statutes of 2013) to advocate for increased use of active modes of transportation. SB 99 encourages partnerships with the California Conservation Corps and certified Local Conservation Corps on ATP projects by including them as one of the project selection criteria. Applicants that do not consult with both the State California Conservation Corps and certified local conservation corps are deducted scoring points and are ranked lower. The CCC increases the public benefit of these projects by creating workforce development opportunities for young adults. The CCC provides supervised crews of 10-15 young adults trained and equipped to work safely on a wide variety of projects related to the priorities of ATP. In addition to the ATP funds administered by Caltrans, AB 97 (Ting, Chapter 14, Statutes of 2017) directs $4 million annually, beginning in the 2017-18 fiscal year for the next five years, to the California Conservation Corps and certified Local Conservation Corps for active transportation projects. For more information about these ATP funds, see contacts below.